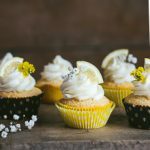 The Most Amazing Lemon Cupcakes | Pretty. Simple. Sweet. These are my favorite lemon cupcakes. They are moist, tender, have the perfect balance between sweetness and tanginess, and are bursting with lemon flavor. My palate has changed rather drastically in the last couple of years, and while I didn’t like cupcakes and lemon desserts that much, now lemon cupcakes are one of my favorite desserts. Lemon has actually become one of my favorite flavors, and I think it can do miracles to a plain cake. Plus, in cupcakes especially, it helps to cut down on the sweetness quite a bit, so if you’re not a fan of classic sweet buttercream, you might still love these cupcakes. You just have to! These cupcakes are moist, delicate, and full of lemon flavor. The frosting is a simple classic buttercream, made mostly of butter and sugar. Luckily, these cupcakes are worth every single calorie. For both options, you should add either lemon curd (homemade or store-bought) or lemon juice and zest to the frosting until you reach the desired taste. For enough frosting to frost 12 cupcakes, I like to add about 2 teaspoons of zest and 1 tablespoon juice, or a few tablespoons of lemon curd. 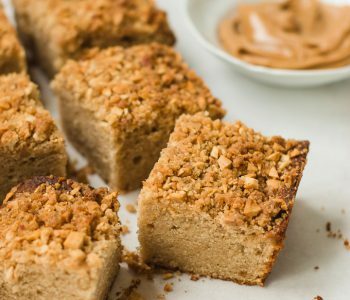 You can add as much as you like, of course, but just make sure that, if you’re using cream cheese frosting, to only add a little bit of juice at a time. Otherwise, the frosting can be too thin. If that happens, add more powdered sugar until desired thickness. You’ll notice that I toss the lemon zest together with the sugar. That’s my little trick for bringing out lemon flavor in baked goods. 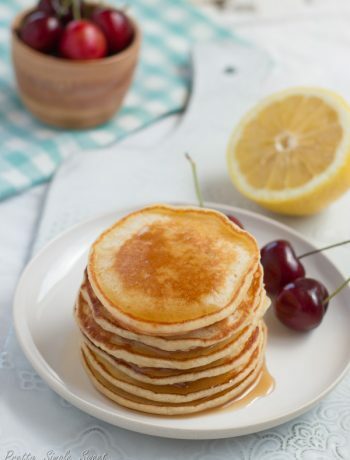 Doing this causes the lemon zest to release its natural oils, which will absorb quickly into the sugar, helping to distribute the flavor throughout the batter. Just be sure that, when grating the zest, you only grate the yellow part and not the bitter white pith beneath it. If you want to make these cupcakes even more delicious and lemon-y than they already are, you can add lemon curd filling to the center of each one. It’s so good! Homemade lemon curd can be prepared ahead of time and frozen for a couple of months. I always make a double batch, freeze it, and thaw as much as I need to use for filling cakes, pavlovas, doughnuts, and more. This amount of frosting is enough for me to frost exactly 12 cupcakes, but I don't use a lot of frosting for each cupcake (as you can see in the photos above). If you want more frosting, multiply the frosting recipe by 1.5. For the cupcakes: Preheat oven to 350°F/180°C. Line a muffin tin with cupcake liners. Set aside. In a medium bowl, sift together flour, baking powder, and salt. In another small bowl, toss together sugar and lemon zest until combined. Using a mixer fitted with the paddle attachment, beat together butter and lemon-sugar mixture on medium speed until light and fluffy, about 2-3 minutes. Scrape down the sides and bottom of the bowl as necessary. On medium speed, beat in eggs, one at a time, beating well after each addition. Add vanilla extract and beat until combined. With the mixer on low speed, add half of the dry ingredients and beat just until combined. Add milk and lemon juice and beat until combined. Add the other half of the dry ingredients and beat slowly until just combined. Do not overmix – the less you mix, the lighter the cupcakes will be. Divide batter evenly between the cups, filling them about 3/4 full. Bake for 15-20 minutes, until a toothpick inserted into the center comes out clean or with just a few moist crumbs. Allow cupcakes to cool in pan for 10 minutes, then remove from pan and allow to cool completely on a wire rack. 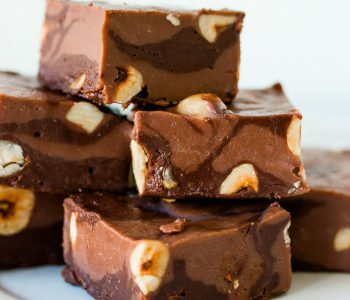 For the frosting: In the bowl of an electric mixer fitted with the paddle attachment, beat butter on medium speed until smooth, creamy, and the consistency is similar to mayonnaise, about 2 minutes. Add 3/4 cup (90 g) powdered sugar and beat well until smooth. Add cream, lemon juice, and lemon zest and beat until combined and smooth. Add another 3/4 cup sugar and beat until completely smooth and fluffy. Beat in more sugar as needed, until desired consistency (thick enough to pipe). Frost cupcakes once they’ve cooled. If you wish to add lemon curd filling: Once the cupcakes have cooled, cut a 1/2-inch hole in the center of each cupcake using a spoon or melon baller. Spoon about a teaspoon of lemon curd into the hole, then frost the cupcakes. Thank you so much for the recipe. The lemon cupcakes look so beautiful and delicoius. I like the way you decorate the cupcakes. It is so elegant and stylish. Just perfect Shiran! 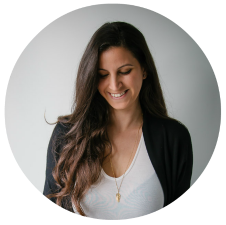 I always love coming & visiting your site to see what sweet creations you have created this week. Pinned! That’s so sweet of you Thalia, thank you so much! We read each other minds! I just posted a lemon cupcake recipe yesterday! Mine is with raspberry buttercream. I also love lemon, especially with desserts! 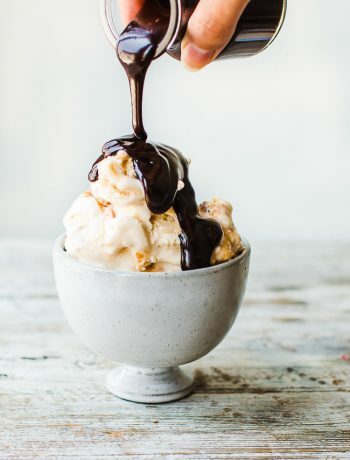 That tanginess balance perfectly with sweets. Your cupcakes look stunning! Love the fresh flower on top. Thank you, Lokness! I love lemon cupcakes because it balances the sweetness perfectly, and one of my favorite things to add to it is raspberries! They are the perfect combination! Ha! Ha! Three cupcakes eh? 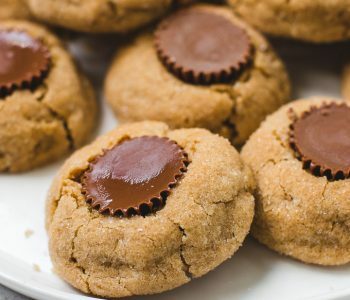 I can see why though as these look so yummy and I bet they went down oh-so easy. 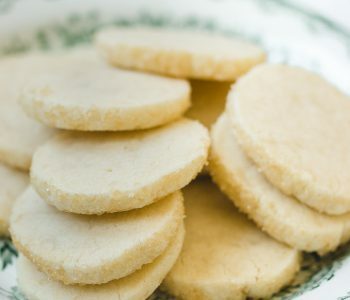 But then again, I am partial to lemon and I love the idea of adding a little bit of lemon curd to these already lovely treats. At least three cupcakes 😉 I add lemon curd all the time and it’s so good! 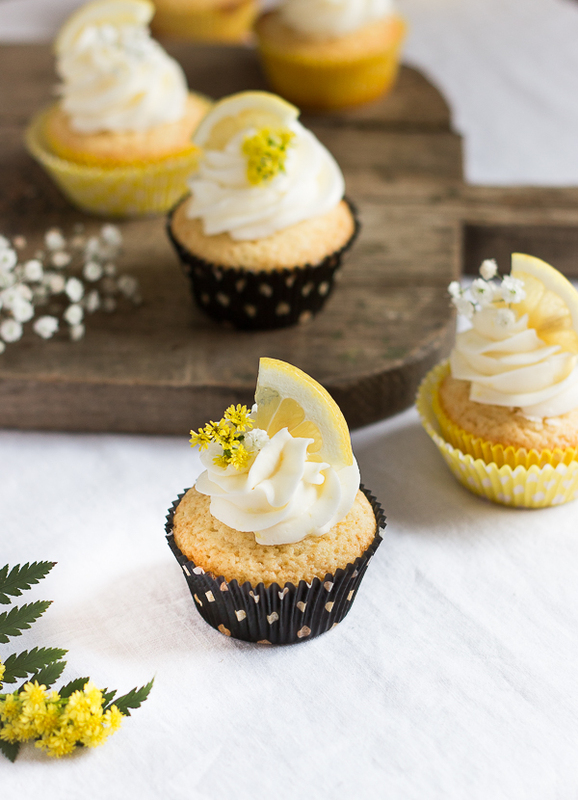 These are the prettiest lemon cupcakes ever! 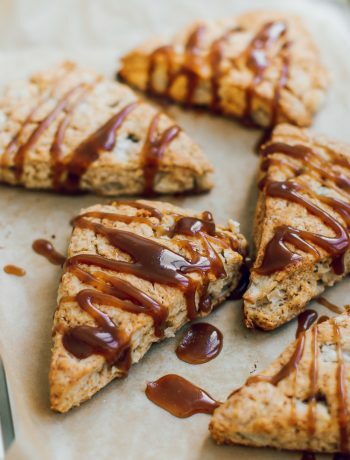 I just love the way you’ve garnished them, and your trick for tossing the zest in with the sugar is brilliant! Hi there, what a beautiful space you have here! It’s like getting lost in a delicious world of desserts. 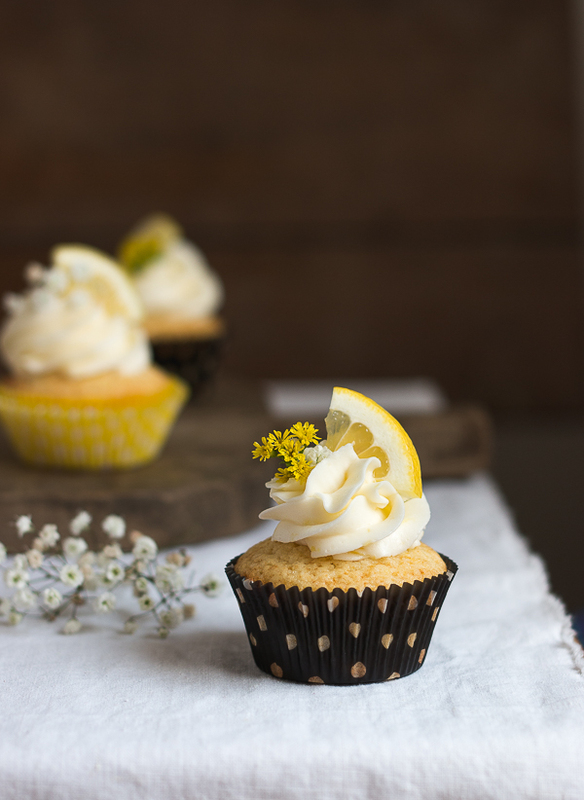 : ) These lemon cupcakes are lovely…I also use the trick of rubbing the zest into the sugar, a great tip I first read about from Dorie Greenspan. : ) Citrus zest is amazing stuff and brightens everything up. 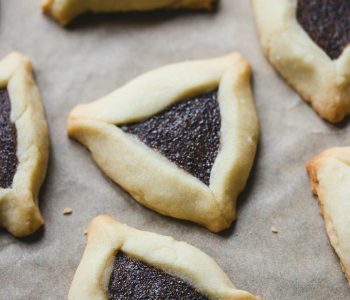 הם מאדדדדדדדד יאהבו את הקאפקייקס האלה (גם אני! ), רק שהם מוזרים ומעדיפים ללא קרם למעלה. Hi Shiran, I haven’t had lemon cupcakes in a while, I think I need to change that. Your cupcakes look so perfect and I just want to scoop some of that buttercream frosting my way…I’m with you, why wouldn’t anyone love that buttercream? Beautiful pics! 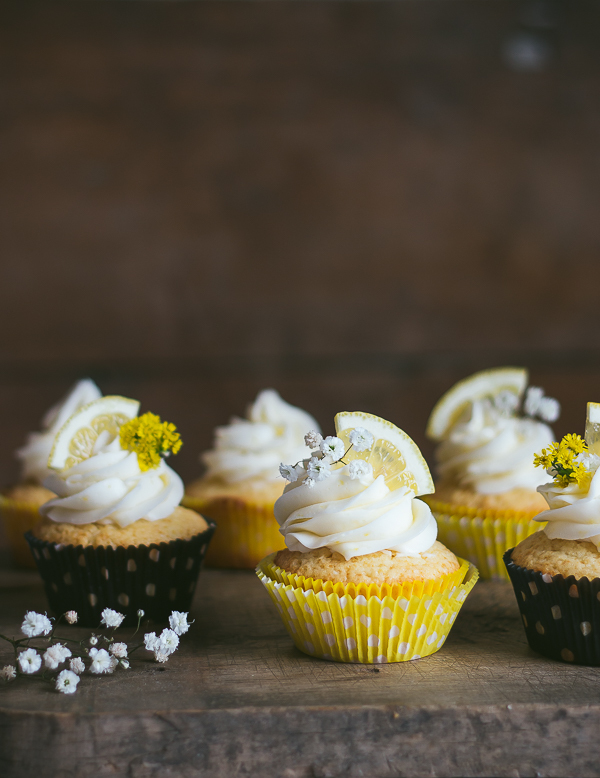 Wow，lemon!These lemon cupcakes must taste fresh graceful,and your pics are beautiful as always.Happy springtime,Shiran! Lemons, lemons everywhere. What to make? These cupcakes, simple and delish. Frosting is amazing. Thanks for sharing the recipe. Looks great, and I’m going to make these for my daughter’s 1st birthday party this weekend. I like the flower touch, but I have no idea what kind they are (the white and the yellow). Could you tell me what they are please? Thank you. Hi Mark! Actually I don’t know much about edible flowers, my friend gave me them that day. Sorry I couldn’t help! Thank you! I’m going to show the picture to someone in a flower shop. I’m sure they can identify it. It might be as simple as baby’s breath or something similar. Or you could just use different flowers, I’m sure they would all look beautiful! Hi Michael. I don’t know the exact size, but this might happen because the size can be different across different brands. It also depends on how much you fill the cups with batter. Your recipe was lovely and I enjoyed making the lemon cupcakes. Just found this and SO need to make them. I don’t know if I missed it somewhere, but what are those flowers you decorate with, absolutely love the work of art of the decorating! I will be doing cupcakes for an 80th birthday party in a few months, and would like to add these as one of the varieties. Hi Stefanie. 1 cup of flour = 140g. Some recipes say it’s 125g, but there are 2 ways to measure flour, and I find this measurement to be more accurate after testing it among many people. Always use the weight for the most accurate result in my recipes.